This week it is my desire to share with you my observations regarding how both sexes approach the question of confidence. As a keynote speaker I have had the opportunity to work with hundreds of men and women, and as a consequence, have witnessed a common pattern over time. Men are not more confident than women, they just have greater permission! It is my intention to encourage you today to give yourself greater permission both professionally and personally. 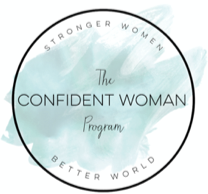 This week's blog piece is taken from my Confident Women Program and outlines the main points raised in Confidence Catalyst Video 3. Now let's take a moment to talk about MEN. I love men, and I love what men have to offer. I want this program to encourage healthy, sustainable, generous relationships with the men in your life. You do not need to push anyone down in order to lift yourself up. Stepping into your confidence does not mean we need to put men down in order to move women forward. In fact, the exact opposite is true. Confident women need to enroll men in a more generous vision and possibility. My desire is for you to let go of any intimidation, anger or fear that you have about men and realize that men are not more confident than women, they just have greater permission. It has been my observation that the vast majority of men are not looking for permission. However, many women look for examples to see if what they are doing is "right." Men are not as afraid to make mistakes. They give themselves greater permission to get it wrong. I see women getting stuck judging themselves if they do not get it right. Judgment is the opposite of permission. Judge yourself less and give yourself permission more! We are not competing with men. We are enrolling them in a greater possibility, a possibility that feels better and is better for them, us and the world! Personal permission and confidence are intertwined so I encourage you not to wait for someone to give you permission. Practice giving yourself greater permission. More confidence means greater permission. When I speak, one of my favorite exercises is where I will hold up a $20 bill and ask, "Who wants it?" People will raise their hand, wave their hand around and of course, shout out, but it takes time for someone to get up, leave their seat, walk to the front of the room and take it. The entire point of this exercise is to realize that it is the minority of people who give themselves permission to participate fully. If you desire to give yourself greater permission both in your personal and professional life today, go to my Confident Women Program. Not only can you watch all the Confidence Catalyst videos, you will also receive 52 weeks of affirmations to help you grow your confidence. Susan and Freeman are excited to be working with Cal Poly Pomona Foundation Dining Services. We are providing our full Group To TEAM Leadership training to support them to build a more powerful culture of TEAM. Over the last few months we have provided live trainings for managers and employees as well as group and individual coaching with key leaders in the organization. We are excited about the “High Five” culture being created and the positive results that have been generated. Great work TEAM! Newer PostI see me. I like me. I love me!